Cells are constantly changing - new bone is made and old bone is broken down. When you’re young this happens fast... you reach your peak bone mass in your mid-30's. Although your bone continues this process - they slow down as you age. Menopause - the dropping estrogen levels - decreases this process dramatically. This is healthy spongy bone... just like what we saw in the Bones Workshop. 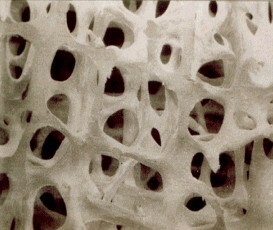 This is bone with Osteoporosis. 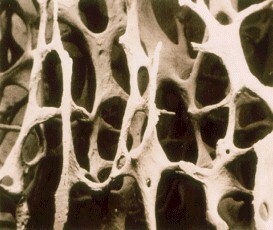 The 'holes' are much bigger because the bone is not being replaced as it should be. Can you see how brittle this bone is compared to the healthy bone? !